Toe increases - How do you do yours? I recently shared a tip for toe increases in toe-up socks and there was so much interest in it and general chatter around the whole issue of sock toes that I thought it merited it's own blog post. I'm sure that non-sock knitters would be astounded at the level of interest shown in the humble sock toe, but we of course are enlightened Sock Knitters and thus, appreciate the beauty of a perfectly constructed sock toe. Usually performed as k1, m1r, k to 1st before end, m1l, k1. Usually performed as, k1, yo, k to 1st before end, yo, k1. On the next (non increase round these yo are worked through the back loop to give a lovely flat finish). I also like this method because it is impossible to get confused as to which round you are on - not even I can miss a glaring yarn over on what should be a plain knit row. There are, of course many other toe options such as the asymmetric toe and the short row toe - I'll be taking a closer look at these next week. The strap line for Berry Colorful Yarnings is "Where color plays" and that handily sums up everything I love about Michelle's attitude to colour and self striping yarn. I was first introduced to the USA-based indie dyer through the wonderful Golden Skein yarn club. Three different indie dyers were asked to produce an exclusive colourway based on a given photo - for this particular collection it was a stunning Peacock Butterfly - and each dyer came up with strikingly different interpretations. Michelle's choice was for a really bold black and red self stripe which was was initially a surprise but as I unwound the skein and started to work with it I realised just how much subtle shading there was within each band of colour. The tones in the red and black/grey bands made for really entertaining knitting and my Peacocks Revenge socks simply flew off the needles. I chose plain stocking stitch socks for these (toe-up, obviously) to let the beauty of the stripes shine through. Since then, I have followed Michelle's work with great interest and love seeing her regular shop updates - there is always something bright and colourful to catch the eye and tempt you. Obviously I am in the UK and thus can fall prey to customs charges but I was so smitten by her exclusive Halloween theme last year that I couldn't resist. And even having my package held to ransom by UK customs for two weeks couldn't dim my joy at the fun package that awaited me. If you are a fan of bright, fun , clear colours do go and check out Michelle's website - just don't say you weren't warned. It's been a bit of a busy week or two around these parts. Lots happening and lots of exciting milestones along the way. It's no secret that I absolutely love Instagram. It's my favourite social media platform (barring Ravelry, obviously) and I love it for it's sense of community and belonging. It is a great way to connect with like minded fellow crafters and I would rather not admit to how many hours I've spent browsing perfect bullet journal spreads, or admiring perfect landscape photographs. I was thrilled last weekend to realise that I had passed the 4000 followers milestone, without really realising it. There has been much talk about Instagram in recent weeks, and I even did a short blog post about it here. There has been much talk of strategy, of content and engagement. About scheduling your posts to optimise your reach and lots of other advice - some of it really great. Heaven knows, I'm no social media expert, but it always seems to me that if you use a social media platform as a 'real human being', interact and share experiences with your community then you are naturally going to build up a following along the way. People like to chat with and share experiences with others - it's why most of us are using Instagram after all. Anyway, before I disppear off on another IG rant, one of the fun things about this week has been the decision to revisit a few of my older sock patterns and offer each one for a 50% discount - one for each day of the week. I have really enjoyed going through the various projects on Ravelry and seeing how people have interpreted the pattern. I tend to stick to solid or very lightly variegated yarns for my designs but I loved seeing some funkier versions in variegated or even self stripe yarns. There has been a great response to this and your supportive and encouraging comments have really helped to make my week. 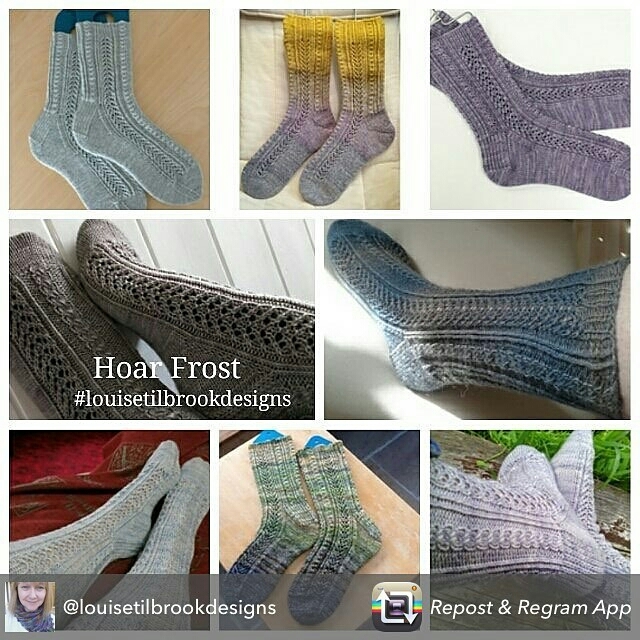 I am also planning to expand my teaching horizons a little and this week saw the announcement that I will be running a sock knitting workshop on July 16th, hosted by Joeli of Joeli Creates. I am really excited by a day of sock knitting fun and even more excited by the chance to visit the after party at Countess Ablaze's studio. I recently found myself heading out of the house to take offspring to an after school sports class. Imagine my horror when I realised that I had no suitable, portable project to take with me. I had recently cast off some plain vanilla stripy socks and a garter stitch Hitchhiker - both being my default options for 'grab and go' knitting. In desperation I cast about looking for something to take and for a brief moment of insanity contemplated trying to wind a skein of sock yarn in the 2 minutes I had left before departure. I contemplated taking my Kindle - it was out of charge. I contemplated not taking anything with me at all - I didn't contemplate this for very long, obviously. Spending an hour seated with other restive parents on too-small chairs, watching one's children karate chop each other is one thing. Doing it without any form of occupation at all is quite another, so in desperation I grabbed my drop spindle and a handful of fibre. As a knitter with a capital K, I knit anywhere and everywhere and I am accustomed to the strange sideways glances, the covert looks and the odd comments regarding "Grandmothers", "dying arts" and crochet. Can I just say for the record however that drop spindling in public takes this level of interest to a whole new level. The assembled parents couldn't have been more astonished if I had brought in my own goat and proceeded to milk it. Starting my drop spindle off requires a certain amount of concentration (this is quite a new skill for me) but once I relaxed into it and got into my rhythm I glanced up to be met with a sea of incredulous faces. Mouths open doesn't begin to hint at the expressions that met my eyes. Once the parent nearest to me had recovered the power of speech she asked me what I was doing. When I replied that I was making yarn she just nodded politely and then moved her chair way, just a fraction. The children however were a source of delight and interest. They were fascinated by the process and the idea of turning candy floss-like fluff into yarn you could knit with seemed entirely reasonable. 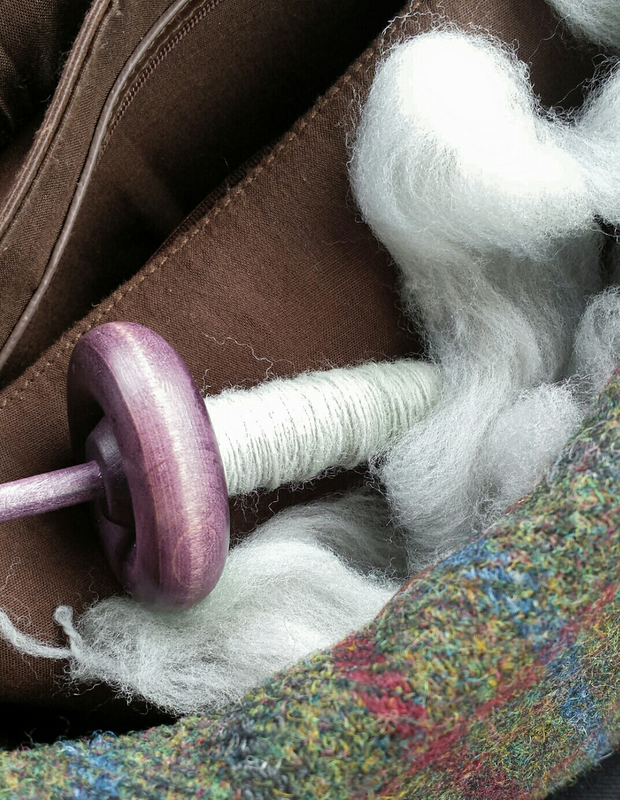 During the hour I got a satisfactory amount of spinning done - and I only dropped it once. And as an added bonus the bossy mum collecting 'volunteers' for sports day gave me a very wide berth. Result! This week has been all about the proposed changes to Instagram and how the service might look in the future. users of IG have been long used to a chronological feed when they log on, and the suggestions that this will change has sparked much discussion and debate. I use IG for both social and business reasons and as such I can see both sides of the argument. As someone who uses IG to support and grow their business, I expect to earn money via IG and therefore have no problem with IG wanting to do the same. They are a business after all. The ability to be better able to target or direct posts is attractive, as it the potential to reach and connect with more potential customers. One of the issues seems to be that many IG users are there, at least in part because they dislike algoryhtmn driven Facebook feeds. They resent "being shown what they like" and like the pure, simplicity which IG has offered up until now. This is a concern to me. If my potential customers are unhappy with (and consider leaving) a particular platform then I may have to seriously rethink my IG usage. A much talked about IG alternative is Ello. It is early days with this site which is only available as a web based browser or for i-phones but I have joined up, along with a lot of other Ravelry folk and am happily exploring it. There are some functions of Ello which IG doesn't have - the ability to quickly repost an image for example, although the non-square picture format takes some getting used to. For now, IG remains my favourite social media site and I don't necessarily think the proposed changes will have much of an impact on me, but it will be exciting to see how this new platform develops. Do pop over and take a look - I'd be interested to know what you think.